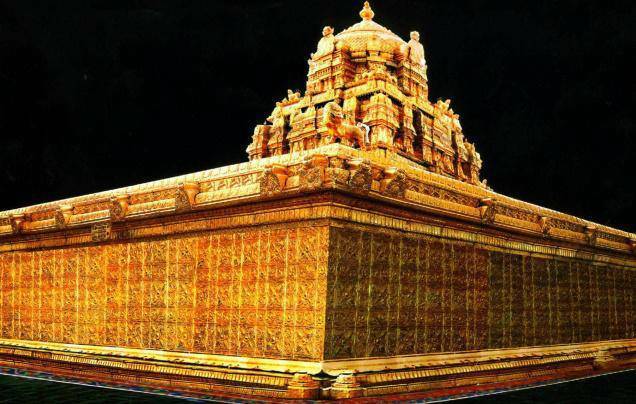 This truly shocking and the most unbelievable miracle occurred,almost three and half decades ago,in the Garbha Griha of the sacred Tirumala Temple that houses the holy Lord Sri Venkateswara,Who by all and by all means is unequivocally considered the richest Hindu God in the world.. This miracle,even today still after thirty six years of it’s occurrence,is a mystery to millions of devotees all over the world and shall remain one forever to many so called atheists of our modern world..It clearly and emphatically endorses the divine existence of Lord Sri Venkateswara in the midst of us today and substantiates our faith in Him.. But Where Is Tirumala Temple And Who Is Lord Sri Venkateswara.. ?? Spread over an area of 10.33 square miles,the sacred Tirumala hill shrine consists of seven hills namely Seshadri, Neeladri, Garudadri, Anjanadri, Vrishabhadri, Narayanadri and Venkatadri…It is only for this reason that this Temple is also called the Temple of Seven Hills..The main temple of Tirumala Tirupati lies on the seventh hill of Venkatadri.. This truly amazing miracle occurred, in the holy temple of Tirumala, on the mid night of 7th November, 1979..At that time, right from a street urchin to the holy Lord, the whole of Tirumala hill shrine was in a deep sleep. All the busy streets of the temple town were wearing a vacant look..Except an occasional sound here and there,the whole of Tirumala hills were filled with a serene silence..And exactly during that dark hour and breaking all that silence,this miracle occurred and occurred quite suddenly taking the entire hill shrine of Tirumala with shock and surprise.. The huge Bronze bells,that were hanging in front of the principal deity of Lord Sri Venkatewsara,in the holy Bangaru Vaakili (Sanctum Sanctorum) of the Tirumala Tirupati temple,started ringing on their own – without anyone either ringing them or touching them – sending waves of heavy metal sound across the whole of the Tirumala hill shrine. The security staff,the police,the pilgrims,the officials,the temple staff,the Archakas and the Purohits,who were shocked by the huge sound of the Bronze bells,woke up startled from their sleep and came running to the main Temple. Shocking them further,the bells rang in that fashion for a few more minutes and later stopped on their own.. Which means there’s no way any one can enter the main Temple,until again those doors are opened the next morning by the authorized Temple staff,for the Suprabhatha seva..
Then how is that the bells rang on their own,without anyone touching them,and if that is so who is there inside the Sanctum Sanctorum except the holy Lord Sri Venkateswara Himself..?? Finally,they all came to a conclusion that some pilgrim,by mistake,was locked up inside the main temple and he must have banged those Bronze bells just to draw the attention of the temple staff. Well…This theory seems quite logical…At least from a human point of view..But if that is the case why is that we are calling it a miracle today and where’s the need for me to write about it,now,after thirty six years of it’s occurrence.. ???? Then…What Happened..??? .. Why did that miracle occur.. ??.. And what was its significance…??? God On Call is a powerful book that presents twelve spellbinding true stories based on real life miraculous incidents that occurred in the lives of some extraordinary personalities like Swamy Sri Rangnathananda of Ramakrishna Mission, Music Queen Smt.M.S.Subbulakshmi and Carnatic Music Maestro, Sri.Rallapalli Ananta Krishna Sarma.